5 What is the Best Spotting Scope For 200 Yards? If you're looking for the best spotting scope for 200 yards, something that you can use down at the range or when trekking after elk amidst the ponderosas, then we've got you covered. This list focuses on short range scopes that have the durability to lend themselves to a wide range of uses, while featuring quality optics to help you sight in your guns or to pick out your shots while punching paper. 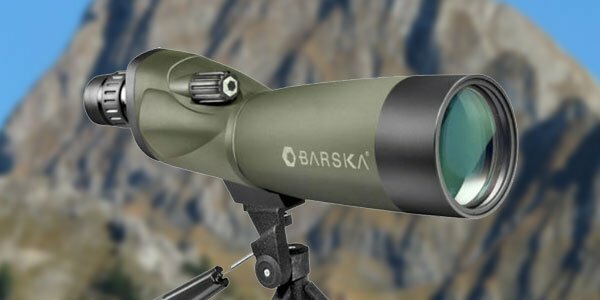 While these are all great scopes, our number one pick came down to the Barska Blackhawk Spotting Scope, which we'll explain in detail below. 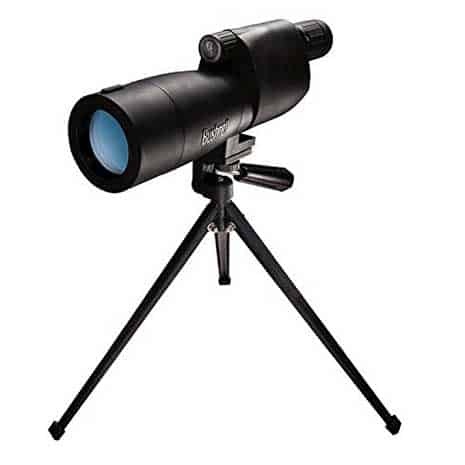 This is a great scope for the money with a magnification range of 18-36x and a 50mm objective lens. It has a close focus of 23 feet and an FOV at 1000 yards of 137 feet at 18x and 100 feet at 36x. It is a full-size scope, measuring 17.5 inches and weighing 3 pounds. It is fully waterproof and fog proof and comes with a pan head lever tripod that fits comfortably with the scope in the included soft carrying case. This scope has quality optics that rival spotting scopes twice its price. The included tripod is fixed and measures 13 inches at the eyepiece. It has a built in sunshade which means one less piece to worry about losing. While the included carrying case is soft, it does have a divider that keeps the tripod and scope separated and provides extra protection. There is little if any distortion or blurring at higher magnification as this scope is truly designed for use at 300 yards or closer. 92% of buyers rated this spotting scope at five stars. The clear optics and lighter weight were stated as being the strong points of this scope, while the clever design of the carrying case (holding both scope and tripod, yet keeping them from bumping against each other) was a big plus for others. What few complaints there were focused on the fixed tripod with one buyer saying the scope seemed cheaply made but gave no further detail on why they thought this. In general, this scope has great reviews with very happy customers. This scope can easily handle greater distances, but its lower magnification range of 15-45x and mid-sized 60mm objective lens make it a great choice for shorter distances. The precision ground fully multi-coated optics are made of BK-4 glass and provide excellent light transmission for clear images with high color contrast. This scope measures just 13 inches long and weighs one pound. It features a retractable lens shade, rubber armored housing and is fully waterproof and dustproof. The FOV (field of view) at 1000 yards is 142 feet at 15x and 89 feet at 45x. The top-mounted focus dial is easy to locate but is a bit difficult to turn at first. However, with use the knob does turn more smoothly. This scope is a step-up from entry level scopes, so while the price tag is a bit higher (retail list price coming in just under $400, with discounts of over $100 normal,) the quality in optics is also considerably higher. Unlike many scopes, this does not come with a tripod and only comes with a soft carrying case. This compact angled spotting scope for 200 yards measures a mere 8.4 inches and weighs around 1.5 pounds, making it a great lightweight choice for the range or the field. It features a magnification range of 16-30x and a 50mm objective lens to give you clear images of your shot or the ability to track your prey through the underbrush with ease. This scope has a durable rubber-armored housing and is waterproof to a depth of 5 meters, providing excellent protection against moisture and dust. It is also nitrogen filled making it fog proof and increase its life expectancy. This is a lightweight scope that won't take up a lot of room in your range bag or weigh you down out in the field. The magnification range and quality optics provide more than enough power for clear images at short range. Due to its compact size, this scope can be handheld, however, a sturdy tripod (not included) will provide clearer images. It has MINOX's proprietary lens coating, offering additional protection and providing exceptional clarity. This scope has great reviews, with 75% of buyers rating it 5 stars and the remaining 25% of votes all giving it 4 stars. Buyers love the compact size and the sturdy design, as well as the light weight and versatility that makes it great for throwing in your backpack for an afternoon hike to spot birds. There were some complaints that the focus ring was a little stiff and thereby difficult to turn. 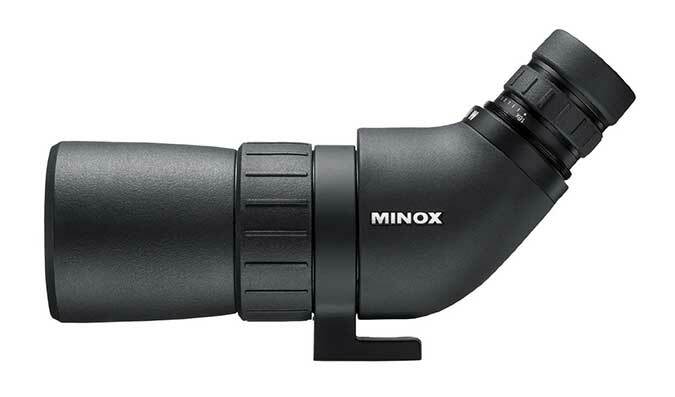 See more of this Minox Spotting Scope... Click here. This is a lightweight, full-sized scope with a rugged construction that makes it perfect for indoor or outdoor use. It features an 18-36x magnification range and a 50mm objective lens. This level of power is great for shorter distances while still providing plenty of power and clarity at 200 yards. The optics are multi-coated and the rubber armored housing renders this scope waterproof, fog proof, dust proof, and shock resistant. It comes with a table-top tripod and a soft sided hard carrying case that is water resistant. This scope has enough power to handle short or long distance shooting though anything past 500 yards may be iffy. It comes with both a hard and soft carrying case and is relatively small, measuring 18.2 inches and weighing about 1.5 pounds. It has a durable construction and streamlined design, however, the focus ring could be more clearly marked as there is only a white dot to indicate what power it is at. 75% of all buyers gave this scope a rating of five stars, with the remaining 25% rating it four stars. The quality and value for the price (retail list price of about $200) were the most commonly cited strong points of this scope. Complaints focused upon optic quality after 200 yards, with one buyer stating she bought specifically for long distance and has had no problems using it for such at the shooting range, even under low light conditions. What is the Best Spotting Scope For 200 Yards? These are all good spotting scopes for 200 yards due to their durability and quality optics. 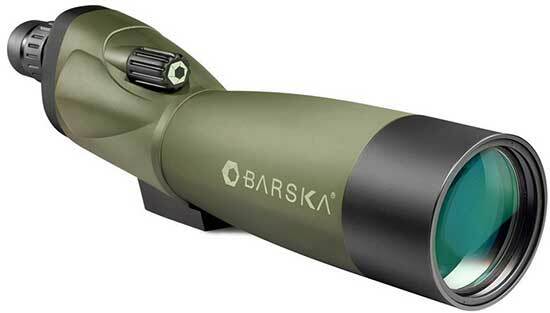 In looking at total features and cost, we felt that the BARSKA Blackhawk Spotting Scope came away as the winner. While it is one of the heavier scopes on this list, it had impressive reviews with great optics that greatly surpassed other scopes within the same price range. Honorable mention goes to the Minox MD 50 W for it's great compact design that lends itself well to casual use as well as being a standard fixture in your range bag. Click here to buy the Barska Blackhawk on Amazon!